Born in Formosa, and currently residing in Buenos Aires, he is the father of five beautiful children (Marcelo, Alfonsina, Francisco, Valentina y Magdalena) and understands that his family is one of the most important pillars that supported him for the development of his professional and athletic career. I started practicing the discipline in the year of 1976. In 1994 I received the "3rd Dan" degree from the International Traditional Karate Federation ITKF president, Sensei Hidetaka Nishiyama. In 2002, during the Master's Course at the La Jolla Summer Camp in San Diego, California, I took the exam before Sensei Nishiyama and the ITKF technical committee, where I was granted the 5th Dan degree, as a recognition to the world-level Traditional Karate career record. I currently hold the 6th Dan degree from the International Traditional Karate Federation. Since I was 17 years old I represented Argentina as a member of the National Karate Team, in all disciplines such as team and individual Kumite (free combat), team and individual Kata (imaginary combat forms), Embu (preestablished attack and defense techniques in pairs) and Fuku Go (Kumite and Kata fusion). I currently am the Technical Director for the National Team in all international events in which our country participates. 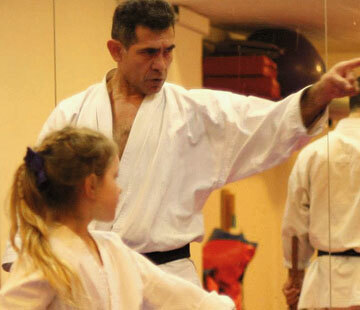 Oral teachings of JUSTO GOMEZ SENSEI. 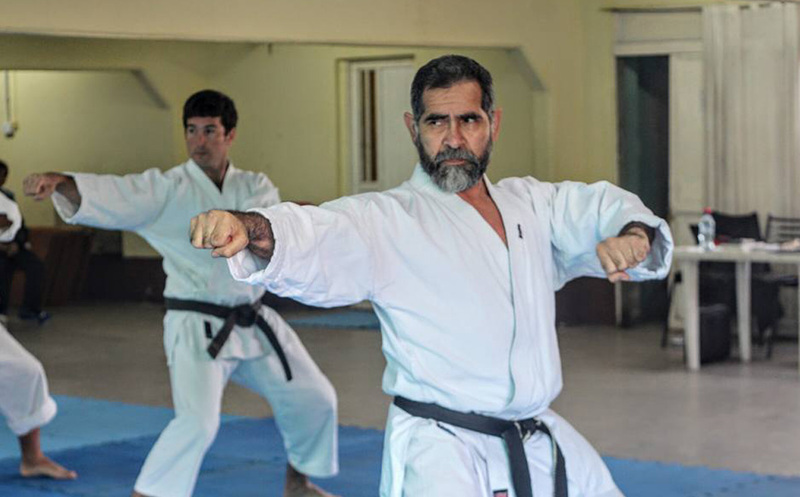 With the landscapes of Ushuaia, Tierra del Fuego in the back, Sensei Justo Gomez presented his first book relating to the essential practice of Traditional Karate. 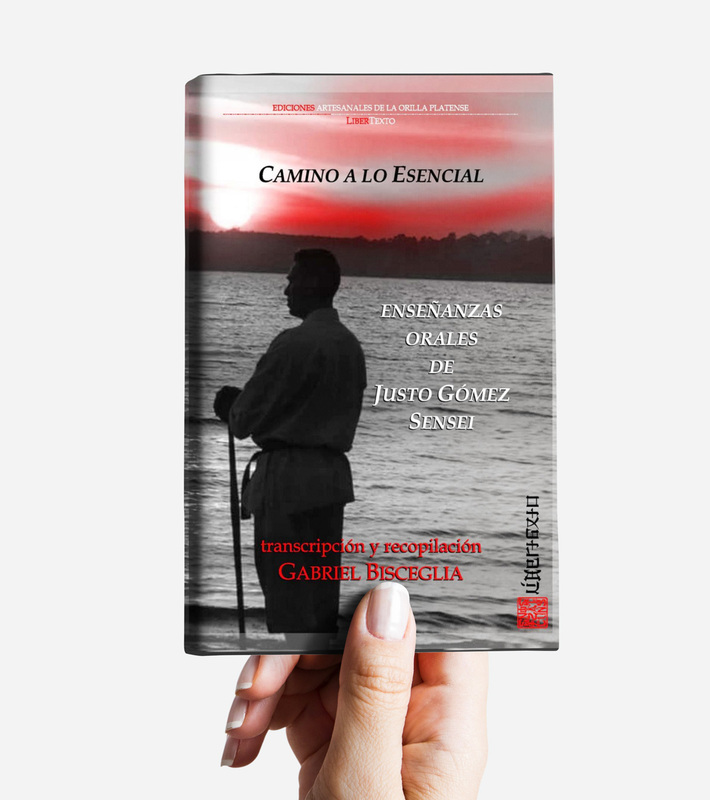 To acquire it, you may contact Gabriel Bisceglia, who has gathered the material and edited it in order to provide everyone the opportunity to enjoy and learn from the experiences and knowledge of all these years of Traditional Karate practice and teachings of Sensei Justo Gomez. A documentary in which a group of renowned professionals and Sensei Justo Gomez expose the gifts and benefits Traditional Karate contributes to the practitioner in their search of Budo as an essential path. 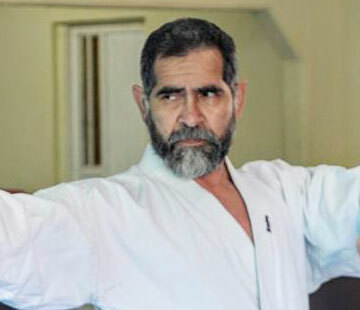 The amount of notes and interviews that have been published about Justo Gomez in the diverse Karate and martial arts related media are innumerable. As an example, we reflect on a small section of the note published on issue 241 of the YUDOKARATE magazine, on which Justo Gomez was featured in the cover. "I believe that one has a body, a technique, a speed, basic things necessary to do Karate or any other discipline. These elements can improve according to one's attitude, and training will be more effective if one has a good attitude. 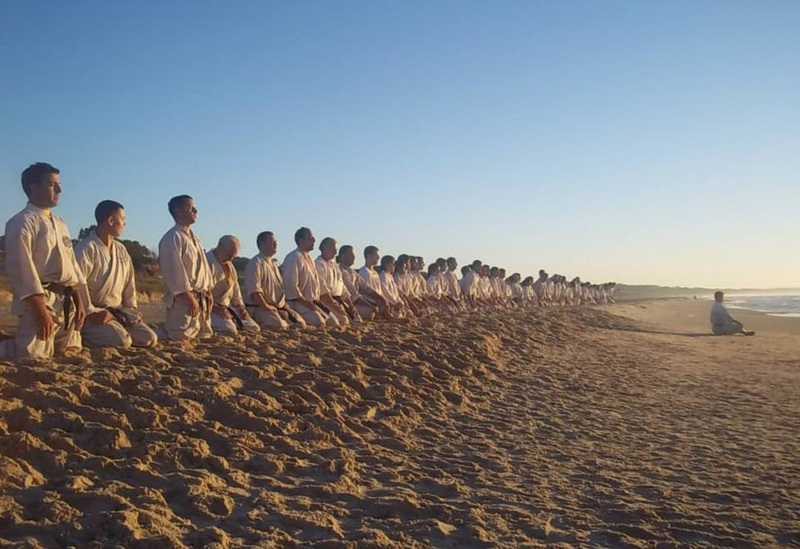 A good attitude is something that makes one take this in a determined manner, not only to improve the movements, but how one feels the technique, how one feels the combat, and seeks to love one's objective even more..."
February 1990 until 2000 - Colonia Uruguay. July 1990 - Montevideo, Uruguay. August 1993 - Cordoba, Argentina. November 1993 - Buenos Aires, Argentina. La Jolla, San Diego - California - USA. From 2003 until the current date. October 2001 - Moscow, Russia. December 2005 - Goiás, Brazil. October 2007 - Warsaw, Polonia. November 2007 - Lima, Peru. The following text from Sensei Hidetaka Nishiyama says a lot about the true meaning of reaching the black belt degree in Karate. In English history a man of valor and dignity who excelled in the arts of combat and social amenities was rewarded with the title of Knighthood. A designation which let it be known to all that he was a man not only of honor, but also of great fighting ability. This was true in Japan where the same type of men was called Samurai. In neither country was the man nor his rank to be taken lightly. For the prowess and title of each commanded respect! At this time both of these countries consisted of feudal states in which men, like the knights and samurai, were a necessary product of the social conditions in which the lived. A situation which does not exist today. Yet the desire for a man to excel in a martial art, for discipline and self-defense, still exists. Today a man strives initially in the martial arts to become a "Black Belt" in karate to learn to fight. But as his training progresses he should become aware of a stronger calling, the molding of himself into a better person, not only in fighting ability but also in dignity and honor. This has traditionally been the goal of the martial arts student. The black belt is an award or honor given to the modern knight or samurai who has sacrificed many hours in disciplining and honing his body and mind to achieve the epitome of physical and mental attainment. The black belt is the symbol of an expert. Originally, the ranking system was established to provide a series of levels by which students could measure their progress. 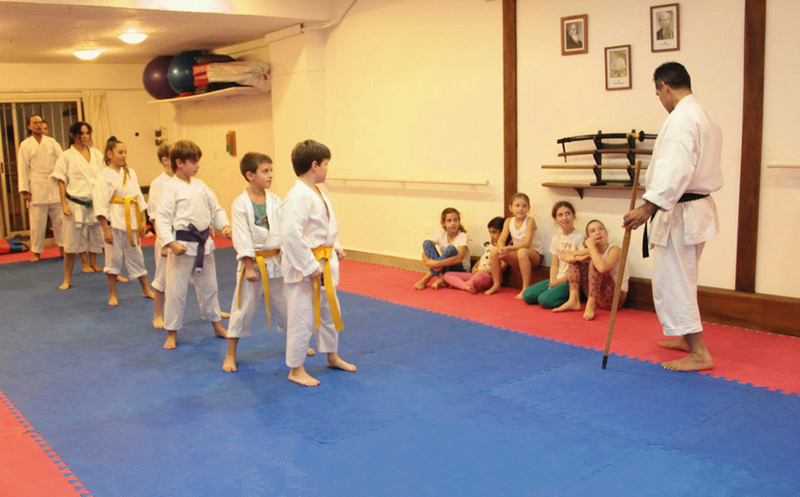 The first black belt awarded for karateka is known as a "Sho-dan". This means the student has mastered the basics of the art and is now ready for a more advanced form of training. The student who continues training will now receive "Dan" ranks or degrees of black belt as he progresses. This ranking system has worked very well in motivation the student, but it also has developed some problems. First, there is a disparity of standards. A proper ranking system should remain universally constant; just as on a ruler one inch is always equal to one inch, so should the standard of rank be equal. 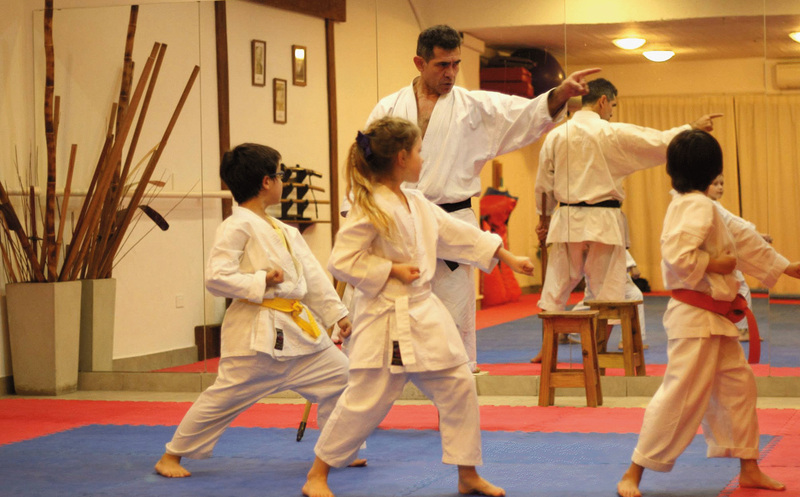 However, it must be remembered that the ranking in the martial arts consists of testing human reaction and because of the individuality of each person it is difficult to declare a definite set of standards. Yet this is what must be done if the rank of black belt is to have meaning. Judo and Kendo have one international standard of testing which prevails through the world. This is due in part to both of them having their origin in Japan where the rules of rank grew with the art. 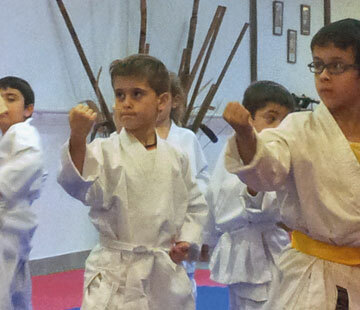 But with karate there were many different schools with each having its own set of standards when it came to test. So, when karate was propagated internationally the various countries embraced each style and each set of standards. 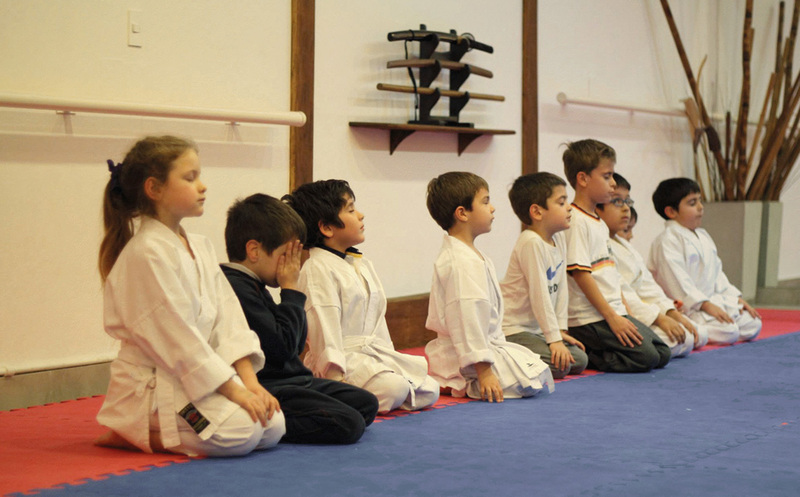 This made possible a situation in which unscrupulous individuals were able to set up their own organization in which they handed out black belts to many unqualified student s who in return decided to set up their own schools and hand out their black belts. Many of these same people also decided to promote themselves for financial gain. The end result is that many black belts are a disgrace to not only themselves but to the art of karate. Someone once commented that just as there are international money exchange counters to re-evaluate foreign money, there will have to be black belt re-evaluation centers also. To this another added, that if these ever came about, the exchange list would be as thick as a telephone book. Since the public is not aware of the differences in ranking and the ability of a true black belt they are easily lured into clubs which will award a black belt to students after only a short period of training. This is not only dangerous to the student but degrades the quality of all karate. The public should be wary of those clubs which use the word black belt as a come on to cheat people out of their money. In a reputable club a black belt can be earned in three to five years of hard work and only under competent instruction. It is for these reasons that karate should have a standard system of testing as soon as possible. It is also the responsibility for those of us in karate to educate the public as to the significance of the karate black belt. Likewise, each karateka must realize that the black belt is not a gift, but a goal, a symbol of one's great effort. 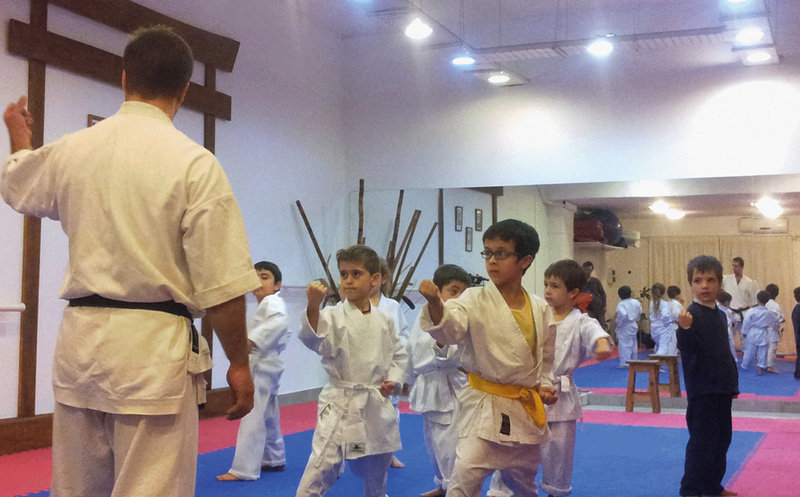 In setting up a high-quality ranking system, not only the student but karate in general will benefit. Thus, instilling a greater sense of pride and achievement in the receiving of a black belt. The knights and samurai of old allowed nothing to tarnish their honor. Should the Sensei and black belts of today desire anything less? The Path of Kumite1 is one of deep self-knowledge. It is a tool of spiritual elevation through the observation and comprehension of the human being in his different planes. Kumite is a dance where life and death are gambled. The Hagakure2 states that one's mettle and dignity must be maintained even in the moment prior to death. Many people have demonstrated a lot of valor throughout their lives and yet, during seppuku (the moment before dying), their knees would go weak. Thus, one can be and act in the same way, as per this norm of the Hagakure. If we think about difficult moments to confront, threats, defeat during a tournament, a failure in life, an important objective not achieved, and if these situations cannot be emotionally dominated, or it becomes difficult to control oneself during these critical times, we are facing a similar situation as the one stated by the Hagakure when it says that 'the legs give in', however we are not facing death but an unaccomplished goal or a tough situation. From the moment prior to death to a simple difficulty or failure exists an ample distance that differentiates them, all the more reason to be careful and stable in front of great emotions or adverse feelings, fruit of critical moments that we will have to face in life. All we are is reflected upon what we do, our actions, our gestures, our attitude, as well as how we express ourselves through our body. In any small gesture or action, we can find the personality of our adversaries, and in it visualize their spirit. The art resides in discerning which are the masks and which is the true face. No one can completely hide who they essentially are for very long in every detail, that is why sanshin in intuitive observation is so important. It is on this concept that the importance of sanshin lies, permanent and constant in our life, in all actions, feelings, thoughts and attitudes. The Hagakure says: "When your heart asks... What will you answer?" When we hear an opponent talk, when we see him walk, sit or stand up, we can know about his fears, virtues, strengths and insecurities, real or apparent, how he faces the facts and how he reacts before certain situations. The conviction of his gestures, words and the visualization of his thoughts show us the attitude by which he confronts his objectives. The precision of his actions, and the power of synthesis, reveals us his domain and mastery in the art. We do not need a previous combat to overcome the opponent, he himself will take the corresponding place we have previously visualized, while we must be successful in him recognizing in us a person superior in the purpose we are going to face. Note: We thank Editorial Kier for part of the material granted for this page. Changes and evolutions are constant along the path. So that we are not surprised by this, and so that we can use it in our favor, we must previously take it into account. No adversary will present the same strategy to solve the same situation twice, where he failed he will undoubtedly change. For the next combats, in the same tournament, he will have changed his strategy, as well as for the following tournaments. Through observation and the study of his characteristics, qualities and attitudes, we can project a tentative line of his development's evolution. Our opponent will present to us according to his characteristics, tendencies, strategies and alternatives, which will however remain within an essential frame. An example is the attitude towards combat, the spirit and his intuitive and unconscious reactions. If a strategy worked for him it is possible that he will keep it and improve it, increasing his conviction and confidence. This observation must be also be done towards people that show growth possibilities, or better conditions than others, whether we have fought them or not. When we refer to characteristics we must consider his physical and conditioning qualities, such as speed, strength, resistance, elasticity and coordination, since these will condition the development and outline of new strategies, having to resort to the previously known and experimented ones. What could improve is the emotional state, the confidence in himself and the conviction of his actions, through the successful experience in the use of that strategy, such as anticipation for example. Training time displays and is reflected upon the years of dedication, practice and technical refinement that has been achieved until that moment. Age tells us how much more time he will continue competing, and this favors the aspect of experience, but at the same time it limits some aspects if he supports himself solely on the physical or emotional. Personally, I achieved better results when varying different techniques and tactics for the different combats I has along the years, preventing the opponents from anticipating the situations I would lay out during the combats and tournaments. An example can be replacing the use of Keriwaza attacks with the use of Tewaza attacks, replacing the Ojiwaza tactic with the Kakewza or Shikakewaza. Finally, we must include a very important concept that will outline our future strategy, learning from our errors so that we are not condemned to repeating them. Having defeated an opponent automatically places us, as of that moment, as his objective and personal goal to overcome, like an obstacle in his path, he will try to take revenge and overcome by any means. To restructure his strategies and improve, he will resort to the assistance of his training partners and masters. The opponents that have been observing the combat will, as well, have analyzed and arrived at their own conclusions, creating and idealizing the strategy that will allow them to counteract ours. Present trainers and masters, with the enormous experiences and knowledge, will direct and counsel their disciples for the following confrontation against us. The fact of winning a combat has these natural consequences, which will increase if we earn a good ranking in a local tournament, and where it takes another dimensions and more considerable characteristics when this occurs during an event with the magnitude of a world cup. Nothing is left to chance in these circumstances. These opponents, and masters, are the best exponents in the entire world. They are present due to their own conditions, capabilities and virtues, which took them there. Winning a world cup means, in these terms, that to every single one of the practitioners around the world we will become their incentive, objective and goal to overcome. Masters, trainers and athletes prepare in each country with all their capabilities for the next event, training and studying their outlined objectives. They will put their maximum energy and will in it. The audience, while admiring the best, they also want to see him fall, even more so if his opponent is local, and therefore their favorite. If we train aware of this reality, our sanshin1 will become something permanent, necessary and natural. Our practice, training and study of each class, each day and in everything must be done taking this reality into account. "Whoever is not aware of this, and does not prepare adequately, hardly will repeat the same feat twice". "We will go as far as the objectives we propose ourselves"
- Our technique, must be the strongest one. - Our strength, must surpass the strongest one. - Our inner energy, superior to everyone else's. - Our perception, the most refined one. - Our desire to improve every time, greater than everyone else's. - Our desire to surpass ourselves each day, the strongest and inexhaustible. - Our search in the essential, the deepest one. - Our fanaticism in what we do, absolute. - Our dedication to the objective, with all our being. I would like to use this space to thank every single one of those that in one way or another influenced my personal and professional development, whom made possible some of the objectives I planned in life. Starting with my mother Ines Vera, for her example and attitude of permanent struggle during the most difficult moments in life. My father Justiniano Gomez, who taught me correct manhood, inspired balance in me and set clear examples in life for me. My brothers, for an unforgettable childhood among nature's fields. My first professor, Alberto Goiris, who made me discover this path and taught me how to learn in this art using all senses. My special thanks to Master Hidetaka Nishiyama; who using the simplicity and depth of his words, gestures and presence inspired me and took me to discover a new dimension of Karate Do, the spirit of Budo. In every encounter with Master Nishiyama I see and confirm that this which he teaches me and I practice from the very depth of my being is an art, an art based on the spirit of Budo. I would like to thank every single instructor who supports and collaborates with the teaching and diffusion of traditional Karate, regardless of wherever they are or what institution they belong to. I would also like to thank the professors who, despite walking the path of different organizations, formed part of the group of people I shared trainings and important moments of my development; Master Mitsuo Inoue, Carlos Prina, Franco Guergo, Oscar González, Ricardo Morikone, Omar Scheneider, Otilio Acosta, Daniel Maehamasaki, among others. To my team mate and loyal friend, Luis Vazquez, with whom we have gone through difficult and glorious moments, being an example of constant growth and evolution. To professor Jose Alberto Campos "Corisco" from Brasil for his faithful friendship and loyalty. To my training partner and friend Victor Bianco, for his purity of heart in friendship. 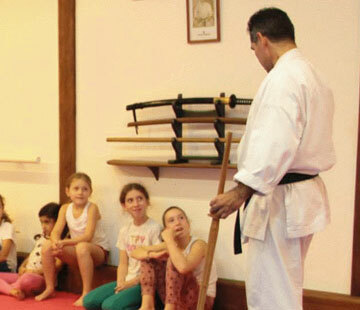 Marcelo Poj, for his friendship and permanent improvement in the comprehension of Karate Do. To my students Maximiliano Gerhard, Walter Rettein and Martín Aguirre, for their loyalty to friendship. They began when still children and today are men of good in society. This vision moves me and makes me confirm the importance of Traditional Karate as education of upstanding human beings, ratifying the need for the transmission of the art in its original form. To all my students, whose dedication to the practice I admire. My respect and appreciation for their valuable company during the path. And the list goes on. If I had to name every single person who in one way or another contributed in my path in this art, to which I dedicate my life, the list would be as extensive as my very existence. My thanks as well to those who set obstacles and difficulties in my path, because them as well as my adversaries, casual opponents and opponents from various parts of the world, inspired me to grow and maintain a permanent development. It is not possible to number all the opponents with whom I have had the honor of fighting, here is a summarized list of those who marked a milestone: Kawawada (Australia 89'), Rosario di Mauro (Perú 90', Italia 91', Canada 92') , Mendoza Junior (México91', Argentina 95', Brazil 96'), Kokubum (Japan 92), Luis Válzquez (Argentina 89', 90', 91', 92'y 95', Puerto Rico 93'), Oscar Rorra (Uruguay 92', 93', Argentina 89', Italia 94'), T. Imamura (USA 94'), Isumiyama (Canada 92'). To Masters Shirai (residing in Italy), Tanaka (residing in Río de Janeiro, Brazil), Ishiyama Katsuya (residing in Venezuela), Kawasoe Masao (residing in England), Takeshsi Naito (residing in Italia), Machida (residing in Bahía, Brazil), Inoki Hiroyasu (residing in Brazil), Watanabe Tasuke (residing in Brazil) ... to them, because their image and presence inspire me and encourage me each day to reach the ideal of Karate Do. To every single one of them I owe the contribution they did to my growth and development in this magnificent art, with their teachings or the inconveniences they set out to me and the difficulties they imposed on me. They made me develop and understand more about myself, about the human being and the various situations we may go through and must solve to accomplish our objectives. Without their contributions, opponents, masters, training partners, friends and family, without each one of those details and experiences I would not have gotten anywhere. The understanding of this, makes me value them, and I am sure I do not do this as much as I should. To them goes my humble and deepest thanks. I ask the indulgence and forgiveness of those friends, students, masters, opponents and people close to me who I involuntarily have omitted in the present list. To them I extend my apologies, and my deepest respect.